The model Load Cell 614 belongs to the S type group of load cells. Transducers of this type are symmetrical and have threaded holes top and bottom to introduce the load which can either be in tension or compression. Typical applications include force measurements, material testing and the monitoring of cable tension in lift and cranes to prevent overload. Other applications include torque measurements on engines (dynamometer), transmissions and power brakes. 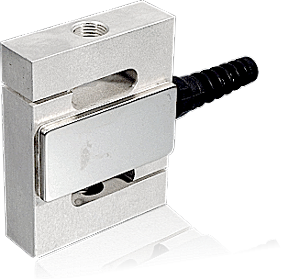 The 614 load cell is fitted with a 6 core shielded cable as standard. Special cables and lengths are available on request.